Invasion by monkeys from natural habitat is forcing many residents of Soluyi/Sosanya Community in Gbagada area of Lagos State, to flee. They called on the state government to save the community from the trouble, saying monkeys forced their ways into their rooms, destroying things, foodstuffs and other items. 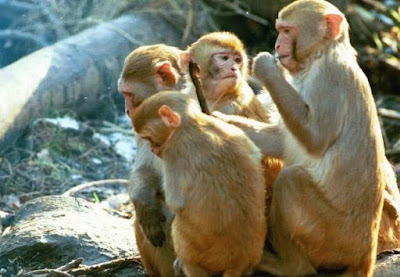 The Chairman of the community’s Landlord Association, Mr. Adigun Olaleye, said that it had become difficult for the community to curtail the monkeys and their destructive attitude. He said that the invasion had been on for years but recently became unbearable. Olaleye appealed to the state government to urgently intervene. Narrating her ordeal, a journalist who lives in the community, Mrs. Funmilola Gboteku, told NAN that the monkeys had forced her family to flee. “I have had to replace the protective nets several times; I am tired of doing it. “I have been locking my windows but locking of windows has disadvantages; there is no cross ventilation in the house and as a result, we suffer heat,’’ she told NAN. Another resident, Mr. Gabriel Omopariwa, said that he was tired of the destructive attitude of the monkeys and had tried to look for ways to stop them, to no avail. “One of my neighbours, while trying to pour a chemical on a monkey, fell in the bowl of the chemical; she had to be rushed to a hospital. A landlord, Mr. Joshua Folowosele, said that the monkeys entered his wife’s shop on many occasions to eat gala, biscuits and other foods. Another landlord, Mr. Oluwatosin Aregbesola, told NAN that his tenants were no longer feeling safe in the house because of the monkeys. “The day I tried to catch one of them, the monkey attacked me by using its long nails to punch a hole in my neck and scratch my face,” he said. Aregbesola appealed to the state government to save the community from the menace.